In the online battle between the Indian entertainment and film production channel T-series and Felix Kjellberg’s PewDiePie, their specific subscribers count has reached more than 90 million. And with it, both the YouTube channels have become two of the only channels to reach a count of 90 million subscribers. Since the beginning, PewDiePie has been winning over the Indian T-series but on March 20, the T-series channel had won with more subscribers count. But that victory didn’t last long for T-series as soon Kjellberg’s channel took over once again and took the win in his favour. It should be noted that the rivalry between the two channels to become the No. 1 channel on YouTube has been going on since the mid-2018. Earlier, the Swedish content creator Felix Kjellberg had reigned supreme over YouTube with the most number of subscribers count on the platform. Kjellberg’s PewDiePie has been one of the most subscribed channels on YouTube for six years, until now. The instantaneous rise of the Indian entertainment channel – T-series – on YouTube has been a constant threat to PewDiePie’s supremacy. Earlier, at the start of 2018, the Indian record label had around 30 million subscribers on YouTube. But since price of 4G data was reduces, and YouTube made its way to some feature phones, T-series’ channel has grown dramatically. And now it stands at the top of YouTube being one of the most subscribed channels in the history of YouTube, with the other being PewDiePie as both the channels have reached more than 90 million subscribers. These numbers are a first for both the channels and the platform itself. There have been several occurrences where both the channels and people associated with them had dissed the other channels. But it just added fuel to the fire which got them more attention and subscribers count. T-series is owned by Gulshan Kumar’s son Bhushan Kumar and till now there had been more than three times where the record label’s channel overtook Kjellberg’s PewDiePie. The first time it overtook PewDiePie was on February 22 for about 8 minutes, second was on March 9 for 8 minutes again, the third was on March 13 for few moments. The fourth and current occurrence happened today on March 20, for about a minute the record label’s channel had overtaken Kjellberg’s PewDiePie. 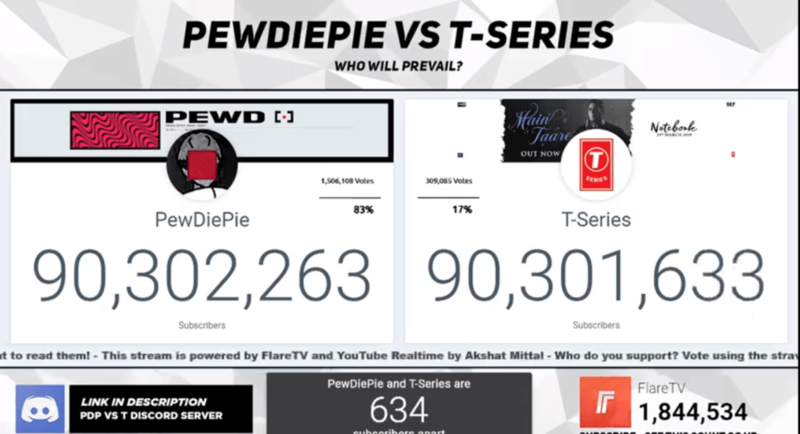 The battle between the Indian T-series and Swedish Kjellberg’s PewDiePie is not over and by April 2019 both the channels might reach 100 million subscribers. With that number they will set new records and become the only two channels to reach 100 million subscribers.